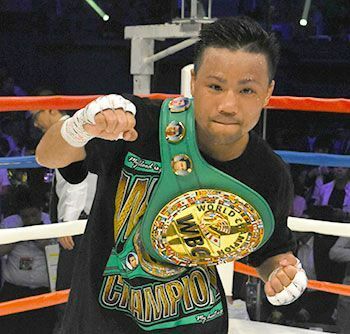 Okinawan boxer Daigo Higa of Shira Gushiken Sports Gym recently took the World Boxing Council (WBC) Flyweight title. He has inspired many Okinawans, and the Ryukyu Shimpo sports honor award will be bestowed upon him on June 9. A ceremony will be held that evening at Pacific Hotel Okinawa in Naha for presentation of the award. This Ryukyu Shimpo sport honor award has been conferred to various Okinawan individuals and teams for their accomplishments in the past. It was awarded in 2010 to the Konan High School Baseball Club for winning Spring-Summer consecutive championships in high school baseball; to golfer Mamiko Higa (now professional) in 2012 for winning two consecutive Japan Women’s Amateur Golf Championships; to Konan High School’s handball team in 2014 for winning the Japan Boys’ Handball Triple Crown; and to the Ryukyu Golden Kings in 2016 for winning four professional basketball TKbj-League Championships. Daigo Higa’s coach, the World Boxing Association (WBA) Light Flyweight Champion from 1976 to 1981 Yoko Gushiken, received a separate Ryukyu Shimpo award in 2016 for his sports-related achievements.